Ladies, What's Up With the 'I Feel Like' Verbal Tic? When I search my Gmail inbox for the phrase "I feel like," infinity results come up. "I feel like this particular story's very up your alley," a professional acquaintance wrote. "I feel like this might be the transitional stage to Federici's utopia," a woman in my book group joked. "I feel like I look too meek in my new profile pic," I worried to a friend. "I feel like I've done nothing of worth lately," another friend confided in me. "I feel like I'm being unhelpful." "I feel like it was important." "I feel like I have to reconcile my expectations." We are feeling so many feelings, and we are very aware that we are feeling these feelings. But most young women I know are self-conscious about how often they qualify their emotions with "I feel like." 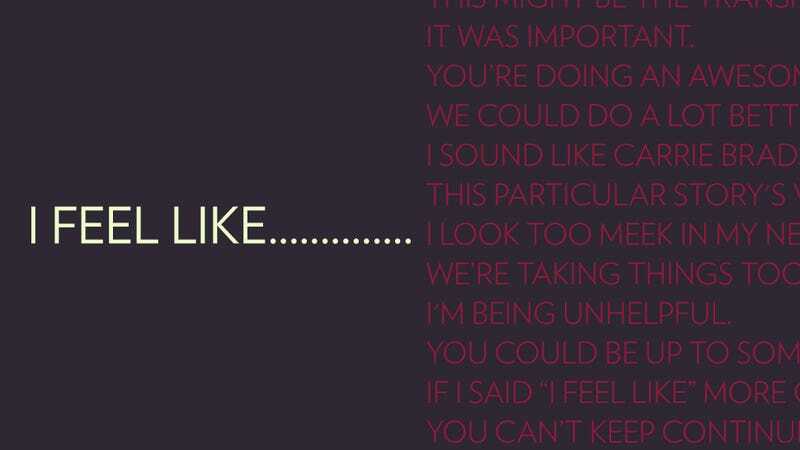 If it's how we feel, do we need to drop an "I feel like" as a prelude to our feelings? It sounds a little indulgent, verging on narcissistic; when I say "I feel like" I feel like (ha) a touchy-feely liberal girl who learned to talk about her feelings in school. It evokes Carrie Bradshaw's pseudo-pensive "I couldn't help but wonder..."
"I feel like" seems sheepish. I don't want to apologize for my feelings! "I never noticed it until I went to college in class, and then men would say things without qualifying them, and women would say 'I feel' or 'I think.'" "I feel like is used for girls to tentatively express their opinion in a nonthreatening way, in a way that can either be added on to or diminished depending on how the other person reacts to it. If you wanna get real deep it's probably another example of girls trying to make themselves as small as possible in the world, the same way we say 'sorry' when someone bumps into US." "It takes the teeth out of any argument you make and makes it okay for you to be wrong. Like you don't have to stand by your opinion because it came from a temporary, emotional place. I use it a lot when I don't want to offend anyone." "I try to avoid it — instead I'll say 'I've noticed' or 'it seems as though' or 'it seems like' because that means things are happening in reality, outside of my head, instead of inside me." But I feel like we only feel anxious about "I feel like" because girls and young women are so often mocked for the way they speak (something I've experienced my entire life and written about at length). A number of linguists recently argued that girls deserve props for, as the New York Times put it, "pioneering vocal trends and popular slang ... in much more sophisticated ways than people tend to realize." My use of "I feel like" isn't stylistic, but it's definitely interactional and intentional. My preferred mode of communication is to talk or type before I'm done thinking, and then work out my thoughts during a dialogue. An "I feel like" preface implies that my feelings aren't set in stone; they're not necessarily rational or well thought-out. I strive to have faith that my opinions are worthy, but I don't want to be the kind of person who is so convinced she has something important to say that she asserts every statement as fact, not feeling. "I find I use the phrase most often when confronting potential conflict or delivering a critical opinion of some kind," one friend said. "It hedges, not by 'deferring' to feelings as less harsh or serious than 'thinking.' I'm being honest about where my opinion is coming from. It's a staple of nonviolent communication, actually, to make the distinction." I find 2110 instances of "I feel like", of which 1468 come from 1046 female conversation sides and 642 come from 481 male conversation sides. This could be because female speakers want to "soften" their assertions somewhat more than male speakers do; or it could be because the overall frequency of the phrase is increasing, and female speakers are leading the change, as they often do. "So my tentative hypothesis would be that 'I feel like' is an idiom that's increasing in frequency in the language, so that younger people use it more than older people," he wrote. "Women use it more than men, because women are generally about a generation ahead of men in most cases of language change." Like, yeah, we are. So let's stop feeling anxious about feeling aware that we're feeling our feelings. Feel me?